Situated on the north coast is Mandraki beach with its backdrop of red sandstone. Mandraki is often advertised as being a naturist beach but the people who now run the taverna get upset with anyone taking their clothes off close to the building. However, naturists still use the far right end of the beach without any problems. By car take the road to Koukounaries and turn right at the Golden Beach hotel. Follow this road for 400 metres then take the right fork up into the hills. (Be sure not to take the first right that has a faded dead end sign). As the road drops down and you lose sight of the sea, the track to Mandraki is on the left. 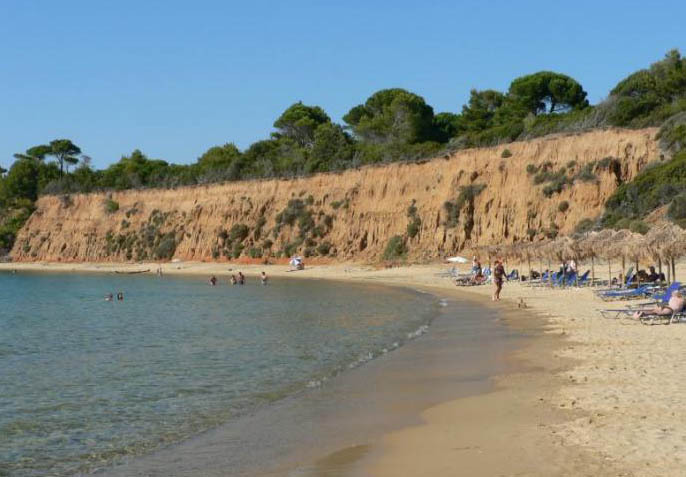 Mandraki beach can also be reached easily on foot. From bus stop 23 follow the concrete track past the Caravos Hotel. Continue through the pine woods - a very pleasant walk - until you emerge on to a dirt track. Turn left for Mandraki or right for Elias.